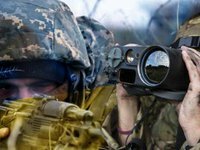 Russia's hybrid military forces mounted 13 attacks on Ukrainian army positions in Donbas in the past 24 hours, with one Ukrainian soldier reported as killed in action (KIA) and another three as wounded in action (WIA), the press center of the headquarters of the Joint Forces Operation (JFO) reported on Tuesday morning on its Facebook page. The Russian occupation troops fired at the positions of the JFO 13 times, while using weapons prohibited by the Minsk agreements seven times at a rate of 40 explosive items of 122 mm caliber, 31 mortar shells of 82 mm caliber, also using anti-tank missile systems, grenade launchers of various systems, large-caliber machine guns and small arms, the press center said. In the area of responsibility of the Vostok (East) operational-tactical group, the militants attacked the positions of the Ukrainian troops eight times: using 82 mm mortars, automatic stun grenade launchers, large-caliber machine guns and small arms – near Vodiane; 82 mm mortars and heavy-duty anti-tank grenade launchers – near Pisky; 82 mm mortar mortars near Avdiyivka; anti-tank missile systems and machine-gun anti-tank grenade launchers – near Opytne; grenade launchers of various systems, large-caliber machine guns and small arms – near Lebebdynske; grenade launchers of various systems – near Avdiyivka; machine-gun anti-tank grenade launchers and large-caliber machine guns – near Verkhniotoretske; easel anti-tank grenade launchers – near Kamianka. In the area of responsibility of the Sever (North) operational-tactical group, the enemy fired on the positions of the Armed Forces of Ukraine five times: using the 122 mm artillery systems and 82 mm mortars from the Novotoshkivske; the 122 mm artillery systems near Krymske; 82 mm mortar and heavy anti-tank grenade launchers – near Zolote-4; 82 mm mortar mortars – near Luhanske; grenade launchers of various systems and large-caliber machine guns – also near Luhanske. "No shelling of the enemy was left without an adequate response from the United Forces," the press center reported. According to Ukrainian intelligence, on April 8, seven militants were killed and six wounded. "Since the beginning of the current day, enemy attacks on positions of the United Forces have not been recorded," JFO HQ said.